Millions of people recognize the Holy Trinity, but few understand that the concept behind it is not limited to a single religion or belief system. What if the Trinity were an ancient code, a formula, a secret so simple yet so powerful, it could change the way we look at our relationship with the Creator and with creation? 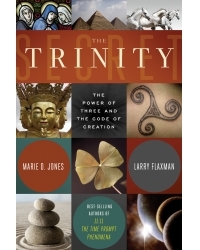 The Trinity Secret began with the simple discovery that a trinity or triune nature plays an integral role in all that ever was, is, or will be. From religion, mythology, folklore and psychology to neurophysiology, quantum physics, and even the cutting-edge world of noetics and human consciousness—the concept of a trinity is universal. The number three is a profound and sacred number that speaks of a secret older than humankind. Join best-selling authors Jones and Flaxman as they embark on a fascinating journey to reveal the secret of the power of three and unlock the code behind the creative force of the universe...a force which each and every one of us has access to. Marie D. Jones is the best-selling author of 2013: End of Days or a New Beginning, The Déjà vu Enigma, and 11:11: The Time Prompt Phenomenon. She has appeared on hundreds of television and radio shows worldwide, and has been interviewed for dozens of print and online publications. She is a popular public speaker and radio show host, and partners with Larry Flaxman on ParaExplorers.com. Larry Flaxman is the best-selling coauthor of The Déjà vu Enigma and 11:11: The Time Prompt Phenomenon. He is president and founder of ARPAST, the Arkansas Paranormal and Anomalous Studies Team, one of the nation’s largest paranormal research organizations, and is a highly regarded public speaker. Larry has appeared on hundreds of television and radio programs, and in print and online publications.